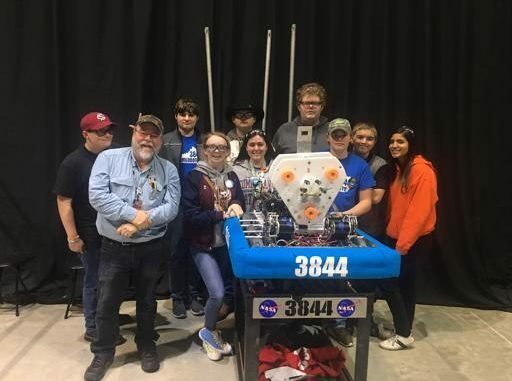 Berea Partners for Education Full Service Community coordinator Arthur Canada, and former Lynn Camp engineering teacher, shares with us a day-by-day account of the Lynn Camp Wildbots performance at the Smoky Mountain FIRST Robotics Regional. Together with current teacher Hank Gevedon, the team has big plans for the future of The Kentucky Wildbots FRC Team 3844. The Kentucky Wildbots came into the Thursday inspection and practice day with some major code issues and untried mechanical additions from after the end of the stop build date in February. Thursday was difficult, the day started at 7:30 am and everyone worked through till 7:30 pm taking lunch in shifts so that work could continue uninterrupted. Friday started off rough but quickly improved after finding all the fixes from the previous day had paid off. After seven qualifying matches on Friday the team ended the day ranked 16th of 52 teams that hailed from 10 US States, Canada, and Germany. The team concluded an 11 hour day Friday making repairs from the beating of 7 hard fought matches. Saturday morning started as usual at 7:30 am with match strategy between alliance mates. There were 3 qualifying winnable matches in the morning before finals alliance selection at noon. The strategy was good but the first match was lost due to a bad battery connection killing power midway through the match. In the next match while playing heavy defense we ripped a wheel module off and blew the bearing races out. With only 45 minutes between matches, the mechanical crew pulled the module straightened it and got it back on but that allowed no time to charge pneumatics. Every part of the top end on the robot in pneumatically controlled. The first 1.5 minutes of the match had to be used just playing defense in order to allow the onboard compressor to charge the system leaving only 1 min for any offense on our part. Team 3844 ended the event 5:5 ranked 22nd of 52. We ran the numbers for ranking after the tenth match and realized that just winning those matches without any bonus qualifying points would have moved them to an 8th seed guaranteeing an appearance in finals. There was no blue banner or shiny trophy, but I saw more growth in this group of young people over these three days than any other in the past. They have big plans for the future and great ideas. Oddly in all the talk, they didn’t mention banners or trophies in their future, just improving the product and including everyone in the process. Young people that really know what it is all about. Photos from the event are available in the kcps.photos gallery.